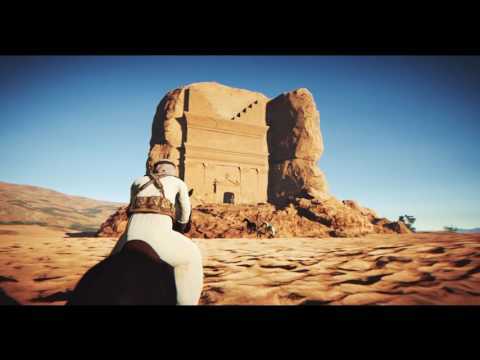 Badiya is a Sandbox Survival RPG set in the WWI era desert lands. Badiya challenges you to brave the sands and thrive in a time where old traditions face the onslaught of industrialization. Trek the sands, take part in wars, ply the spice routes, or hunt for treasure as you strive to fulfill your ambitions. Experience the mystical desert culture just as industrialization was dawning upon it. The desert, with its harsh climate and fierce wildlife also hides such gems as the honor-bound bedouins, sites of ancient civilizations, and rare resources. Simultaneously, the rising industrial power of world war one offers a backdrop ripe with conflict and destruction as horse meets tank. Infinite Procedural Open World: Every time you play you will see different looking terrain, events, enemy encounters, and items to loot. Time of Day System: A full 24 hour cycle is available. You can sleep to pass time and regain stamina. Weather System: Clear, Cloudy, Overcast, Rain with different intensities, Snow with different intensities, Sandstorms and Fog. Character Customization: Control your character ethnicity, skin tone, eye color, facial shape, facial hair, height and weight. Embark on an unlimited number of quests that you can take from the locals that will ask you to gather items, transport items, secure bandit and mercenary locations, find treasures and many more. A fully featured Map System with fast travel option through camel caravans. Choose your own Camera Perspective (Future Alpha): Ability to switch the camera at any time between first person and third person views. Survive: Keep an eye on your biometric indicators such as health, food, thirst, temperature (you can get Hypothermia and Hyperthermia if you are not careful). Balance your diet and food intake in-game because your character can gain weight or lose weight with visible visual difference and gameplay consequences. Crafting: Loot everything you can and gather resources to be able to craft all sorts of recipes for weapons, medicine, and tools. Animals: Hunt prey animals (for meat, fur, fat and bones), be hunted by wild animals, or marvel at domestic animals roaming in villages and camps. You can also utilize horses and camels for transportation. Plants: Collect different types of plants that you can use to craft medical potions to help with poisoning, pain and stamina. Camping: You can craft and place a camp fire which can be used for cooking food and as a source of heat during cold nights, build a smelting station to turn minerals into useful materials, build a crafting bench to build advanced items and sleep in a tent to gain more stamina and health back. Vehicles: Authentic military vehicles including armored cars, tanks, planes, and dune buggies with customization features such as tire armour, different weapon choices, desert camouflage paint job, side lights and more. Weapons: Utilize an arsenal of weapons including side arms, rifles, machine guns and (in future alphas) flame throwers and sniper rifles. Skill Tree (Future Alpha): Upgrade your character across three different fields covering (Combat, Defense and Exploration). Environments: The desert is filled with interesting locations to discover including oasis, bedouin camps, villages, military bases, air fields, oil wells and ancient ruins. Trading: Buy, sell and trade with different merchants across bedouin camps and villages. If you upgrade your Negotiation skill in the skill tree, you will get better deals. Guns Blazing vs Stealth: You have the choice to approach each situation to your liking wither its to launch a full blown attack or sneak your way through undetected. Photo Mode: You can pause the game at any point, move the camera around to frame your shot, change color filters, control camera depth of field and field of view and then capture that perfect shot that you can share on social media. Disguise (Future Alpha): If you are sneaking into guarded military areas or ancient ruins you can increase your chances by wearing clothes that resembles the guarding faction. This will prevent them from detecting you immediately if you don’t get too close. Sea Life (Future Alpha): Build your own ship and navigate to explore different islands filled with treasures, go fishing, or pearl diving in the sea. Underground Tombs (Future Alpha): Equip your torch, lantern and courage and explore tombs that are filled with traps, loot, treasures and dangers. AI Awareness (Future Alpha): Raise your weapon in front of civilian crowds and some of them will run away from you while others will draw their weapons in preparation for possible hostility from you. Procedural Narrative (Future Alpha): Experience a story line that is unique everytime you play along with specific goals. Just like in real life, the end of story is the start of another and in Badiya there is always a new adventure to embark upon. Map Editor (Future Alpha): Unleash your creativity and design custom maps using an easy to use yet powerful map editor. Set the desired weather and time of day, place different types of buildings, fill the place with props like crates and barrels, add gameplay entities like weapons, vehicles, and enemies and finally gameplay objectives such as winning conditions and player spawn positions. Once you are done with your masterpiece you can share it with the world for other players to play and rate in the community section in Badiya. Controls: Switch on the fly between Mouse/Keyboard, Xbox One Controller or Playstation 4 Controller at any time. Lighting: Fully dynamic lighting with Realtime Global Illumination (Future Alpha) and color bleeding. Rendering and Shading: AAA quality Physically Based Rendering to give all objects a realistic look throughout any time of day. Dedicated shading for Cloth, Skin, and Fur. Snow, Water and Dirt accumulation on terrain and objects. Parallax Occlusion Mapping on terrain gives it that extra depth. Cinematic Post Processing: Film Quality post processing effects including Color Grading, Tone Mapping, Eye Adaptation, Sun shafts, Ambient Occlusion, Grain, Vignetting, Chromatic Abberation, Motion Blur and Adaptive Depth of Field. Every single one of those effects can be turned on or off according to your liking. Film Style Anti Aliasing: Temporal Anti Aliasing that prevents flickering while removing jagged edges. You also have the option of using FXAA, SMAA or disabling anti aliasing altogether. Adaptive Soundtrack: Music track that adapts to what you are doing in the game and changes the mood and intensity accordingly. Animation: Character animations are based on motion capture data of a real actor and then enhanced with Inverse Kinematics to achieve greater integration with the world like foot placement on uneven terrain. Destruction: Objects made of wood and clay will break and shatter based on the force you hit them with. In addition to fracture being fully dynamic (not prefractured) you can further destroy the broken pieces into even smaller chunks. Touch Bending: Walking through ground level plants (Like short Palm Trees) will cause their leaves to dynamically bend and react to your physical presence. Water Simulation: Walking through the water surfaces will cause ripples and waves based on the type of movement you did. Water is rendered with screen space reflections, specular highlights, refraction, foam and white caps coupled with caustics for greater realism. Dynamic Fire Propagation (Future Alpha): Throwing a fire torch or a lantern on flammable surfaces like cloth and wood will cause fire to spread dynamically in the area. Interactive Cloth (Future Alpha): Cloth react to wind speed but in addition it will also be affect by physical objects or characters passing through them. Metal Deformation: Like in real life, metal will bend and deform if gets shot or if it collides with other heavier objects. Ultra High Definition 4K Support: High resolution textures ensure a crisp look that is carried over when you play in 4K. The user interface will also scale accordingly to show in a proper and readable way. Fully Scalable: Choose from several quality presets or manually customize every single parameter to get the desired quality/performance combination you are after.